T was born the day after we completed the homestudy for his adoption. When T was born, we were attending a 2-day adoption education class. P was born exactly one week before we completed the homestudy for his adoption. 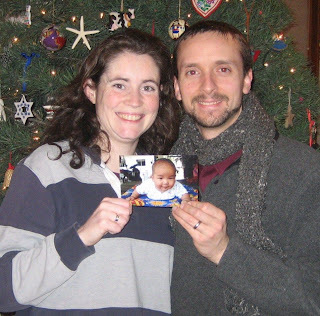 P was also born on the day Kyle blogged that we'd gotten the court date to finalize T's adoption. When we were working on all of that paperwork, the reality of critters coming home seemed so far away. But their lives were already beginning - we just didn't know it yet. And also? I'm trying to come up with nick names to use on the blog. T and P is going to get confusing. Ideas? Robin wrote this more than a week ago, but we're posting it today because we wanted time to tell our families in person. Last night after dinner, I was settled into the couch with some last minute Christmas embroidering in my lap. T was alternating between Kyle and I for stories. The phone rang. It was Marissa. MARISSA, people. Do you KNOW who Marissa is? If you're in the Holt Thai program, you do. So you know where I'm going with this. Kyle answered and was talking so calmly and didn't even gesture for me to pick up the other phone, but I did out of curiosity anyway. And she was calling with OUR REFERRAL! It was so unexpected, and Kyle was remaining so serious during the call, that I was worried that *he* was worried about some of the information we were getting. So *I* tried not to get excited. Until we could talk. Until we could call a pediatrician. Until we could be rational. But really, I was in shock. I simply couldn't believe I was talking to Marissa, on the night before Christmas Eve, about a little boy in Thailand. We headed to the laptop, asking ourselves if we wanted to hold off on looking at the pictures until we could reach a pediatrician (on Christmas EVE? I was starting to panic.). We said yes, let's wait on the photographs. We opened the email to see his face staring out at us. Oops. Too late. We knew he was ours! We made some desperate phone calls and sent some panicky emails trying to find a doctor to work with us before Christmas (how could we NOT DECIDE before Christmas??). I will forever be grateful to one fellow Holt mom for taking time to talk with me for 45 minutes while she was trying to get ready to go out of town. Ultimately, we had some great email correspondence with a physician friend and then a mad-dash across the ice-covered city to get to the pediatrician's office before they closed for the holiday. The doctor we talked to was an adoptive dad himself and we felt so blessed that he took time to see us. He confirmed that there was no reason not to adopt this little boy. That's all we needed to hear. We picked up photos of little "P" on the way home and put them in an album for T. T keeps repeating his name and insisted on taking his nap with the album under his pillow. We haven't told him the pictures are of his brother yet because we're afraid he'll tell his grandparents at church tonight...we have a surprise planned for tomorrow instead. (The plan includes emergency crafting, so I was up until midnight making props!) We considered letting Santa somehow tell T about his brother, but quickly realized that could only be confusing to T.
So now we have stopped sleeping because we are too excited. And Christmas is tomorrow and there is so much we planned to do that we suddenly don't have time for. But I can let all of it go, because I suddenly am matched with a little boy in Thailand and it makes my world look totally different. 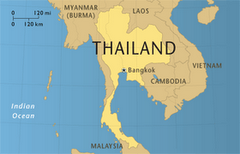 P's name means "utmost progress" in Thai. 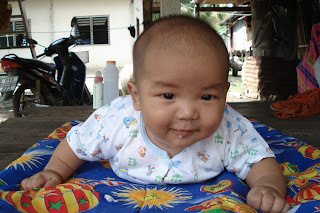 He is living in a foster family in Bang Sai, the same village where T's foster family lives. He turns one year old next month. Did I mention that we're excited? I've already received my present for Christmas. I get a whole lot of free time with my family. It's been a busy couple of months for daddy. This fall I added a part time job to my routine, which added a lot of hours to my work week....although some stategically-utilized vacation time helped ease the weekly workload. Since the part time job is on campus, I'm already done for the semester and enjoying a break before classes resume in January. Being down to one full time job for a few weeks will feel good. The second job has been a change in our routine that results in more T time with mommy, and a little less with daddy. On a few occasions, we had daddy/kiddo days, which were terrific fun. I miss all the extra time I used to have with him, but I'm very grateful we can continue to be home with T.
I also miss blogging. There have been dozens of blog entry topics I've thought of and forgotten about in the last couple of months. I'll have to do a better job of writing them down next semester. I've been thinking a lot about T's future sibling lately. T has made it an easier wait by distracting us with his infectious personality, but we're talking more and more about our eventual trip back to Thailand. T is excited about it, but also raising concerns about us holding a different baby. I suppose it's good he started thinking of this new reality now. Perhaps it will be less startling than a sudden realization that he's no longer our only focus of attention. Some have been surprised to hear how excited I am about the second referral. Apparently, for most families, the anticipation over getting the second referral is less than the first. I can't help but be excited to find out. I never forget that for every adoption story, there's likely sad circumstances behind it. I feel some guilt in being excited, but I can't deny my anticipation. Perhaps you'll hear from me a few more times before I dive back into my books. No doubt we'll have some stories and pics from the upcoming holiday. I was thinking about attachment today because, well, I realized I hadn't thought about it in awhile. T has been so very lovey lately. I don't usually make a point to write about attachment when it's going well, but I probably should, or this blog will give the impression that our attachment with T is always a struggle. It sometimes feels that way, but it sometimes feels easy. The easy times have been rare since I lost my job in September. While I enjoy not working 2nd shift, the change in routine was hard for all of us. But, and I am aware that I am jinxing myself here, the last few weeks have been deliciously sweet. I hear at least 60 cheerful "I love you, Mama! "s a day that are peppered with kisses on my nose, little arms around my neck, offers of back-rubs, and requests to snuggle longer. He pets my hair and tells me I'm a "nice little girl". I think he's in love - I know I am. For the most part, T has been happy and about as compliant as a kid closer to 3 than 2 can be. He still usually prefers me over Kyle when given the choice, but he misses his dad when he's at work and is excited to see him come home. The road to attachment hasn't always been smooth for us, and there seem to be a lot of blind corners, so I'm relishing this patch of road while we're on it. Two years ago tonight, I pulled into the driveway after work to see Kyle running out the back door, waving me frantically inside. He had the phone in his hand, and laryngitis in his throat so he wasn't able to talk to our social worker, who had just called to tell us they'd matched us with a little boy named T, born in Bangkok and almost 7 months old. I tried to keep from shaking as I stood in the kitchen and listened to Marissa read information from T's file. I remember wondering how she thought I'd remember a thing she was telling me. When the conversation was over, we tripped all over ourselves to get the computer open and look for an email that would have the photographs we'd been dreaming of seeing for the last year. We paused before opening the files, looking at each other and holding our breath. Then suddenly, we could see the beautiful face of a little boy whose name we weren't yet sure how to pronounce (and still weren't after we'd been home a full year, but that's another story). Sharing the news of his referral with our family that Christmas was an excitement that I'll never forget. I knew that our lives would never be the same, but I didn't really grasp the enormity of that change. T is my greatest love and my greatest challenge. His successes make me prouder than any personal accomplishment. On tough days, he can make me more frustrated than I knew possible. His joy is contagious and brightens the entire house. I feel lucky beyond words that I'm T's mom. It's hard to believe only 2 years have gone by. Life feels so incredibly different now. ACK! I don't know what happened, but our little boy who once slept in *his own* bed (after 6 months of Kyle sleeping on the floor, inching himself further away from T's bed) is going back-back-backwards and is now sleeping in *our* bed again. After vacation this summer he needed us to sleep on his floor. (And he crawled in bed with us in tears around 3am.) Then he needed to sleep in a "nest" of blankets on the floor next to our bed. (And he crawled in bed with us in tears around 11pm.) Then he needed to sleep in our bed all night. And NOW he's started sobbing about his fear of being left alone at bedtime before we even eat dinner - even though he's sleeping *with* us. Monday, a new low, he wouldn't even take his nap in his own bed with Kyle sitting next to him. HELP! His crying is desperate and frantic and it's breaking my heart! And then, this week, in a strange turn of events, T is suddenly, silently, in his own bed for the entire night. It makes no logical sense to me. I have no problem with co-sleeping, but T wasn't even happy with that anymore. Something had to change. I don't know what inspired me, but in a desperate attempt to try something different, I slid his bed across the room. T can now lay in it and see me laying in my bed across the hall. We had "practice"sessions that afternoon in which we did a super-light-speed bedtime routine (books-hug-kiss-"sleep dust"-blankets-stuffed animals-goonight-i love you) and then he "pretended" to sleep while I read a book in my bed. He kept a close eye on me, but really liked the game of it all. We practiced a lot. The first bed-time came, and there were a few tears. OK, a lot of tears. There were tears, off and on, for several hours. But the tears were totally different than the frantic, desperate sobs we've been having when we were putting him to sleep *in our bed*. They were quieter and just sort of sad, and he never tried to get out of bed. (In the past, we'd never have considered letting him just cry because his crying was totally frantic, and would run out of bed and throw himself on the floor or run blindly down the (at the top of stairs) hallway). He repeatedly told us (through tears, bless his heart) that he was "practicing" and "pretending" to sleep. He "pretended" to sleep in his very own bed all the way until I let him crawl in bed with me at 6am. The next 2 nights? No crying and no crawling in bed with us at all. I think he really *wanted* to be able to sleep in his own bed. (He's told us several times that his friends sleep in their "big boy beds".) All the times we slept on his floor and in the hallway, he was hyper-vigilant because he knew at some point we'd go back to sleeping in our own bed. He'd wake up and not see us. He was just waiting for us to leave and being afraid of it ahead of time. My theory is that now, he doesn't have to fear us leaving, because we're in our own bed already. And he can see us the whole time. For some reason, that distinction is better for his little brain. Or maybe he was just finally ready. Who knows. I have every finger and toe crossed that this lasts. 5/16/07 T born in Bangkok!